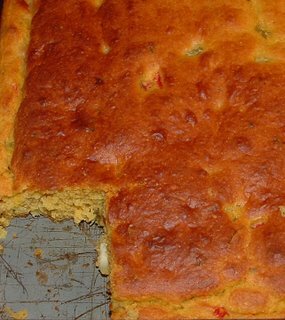 When I made a Mexican themed meal for friends a few nights ago, I made two different corn breads– a dependable favorite and something new that sounded interesting. 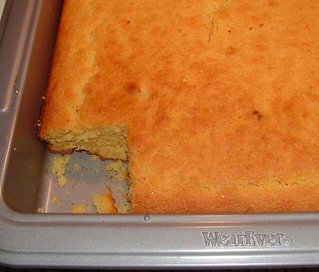 My usual favorite corn bread recipe is from "The Moosewood Cookbook," the version that was printed in 1977 and is out of print. I received it as a gift from my friend, Marie, in 1991, the year before the cookbook was revised for the first time. It’s a charming cookbook because it is hand-lettered and illustrated by Mollie Katzen, who has gone onto bigger stuff since 1977. Because of the cookbook, I’ve always wanted to go to the Moosewood Restaurant, which is in Ithaca, NY. It’s just a couple of hours away, but somehow I’ve never made it there. Makes one 8-inch pan – I often double and put in a 13 by 9 pan. 1. Beat together egg, buttermilk and honey. 2. Mix well together all dry ingredients. 3. Combine all ingredients, including melted butter, and mix well. 4. Spread into buttered 8-inch square pan. Bake at 425 for about 20 minutes – start checking it earlier. I chose the second recipe for the sole purpose of using up butternut squash. I belong to a CSA (community-supported agriculture program) and receive a delivery of organic veggies every week in the summer and fall. This time of year always brings lots of winter squash and cabbage, neither of which I care for. As a result, I’m always looking for cabbage and squash recipes I actually like. Unfortunately, this wasn’t such a recipe. Although the bread was colorful, it was less than an inch thick and the texture was spongy. I also would have liked it sweeter, although that may have been my fault, as I used butternut squash instead of acorn. If I make it again, it will be with a lot of changes. from "Creme de Colorado Cookbook"
In large bowl, mix together cornmeal, flour, brown sugar, baking powder, salt, cumin, herbs, parsley and cayenne pepper. In separate bowl, blend squash, eggs, milk, oil, cheese, pimiento and green chiles. Pour dry ingredients into squash mixture and blend. Pour squash-cornbread mixture into greased 9 by 13 pan. Arrange black olives on top (I didn’t do) and bake at 425 for 25-30 minutes or until a wooden pick inserted near center comes out clean.